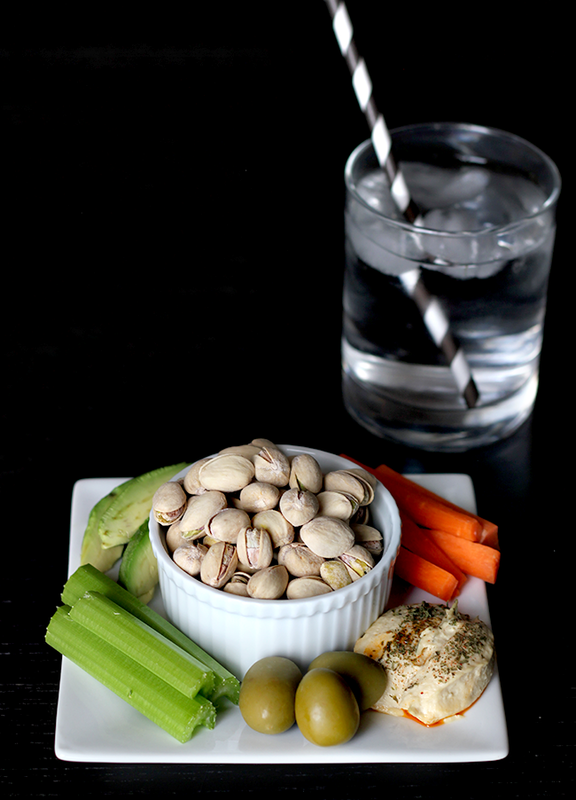 I am, however, still joining in the fun today and celebrating April Fools' Day in a different way, by talking about my current favorite snack - something that has become my recent go-to for a healthy, satisfying daily treat, as well as an easy, delicious mini party plate to serve guests. As you guys know, I've made a shift in my eating habits since having a baby a little over a year ago. I've always been fairly consistent in my efforts to eat well when it comes to meals, but I've really become mindful in my snacking as well, by focusing on healthy, whole foods that are filling without a ton of excess calories. Basically, I've learned to play a prank on my appetite and fool myself full (get it? get it?) 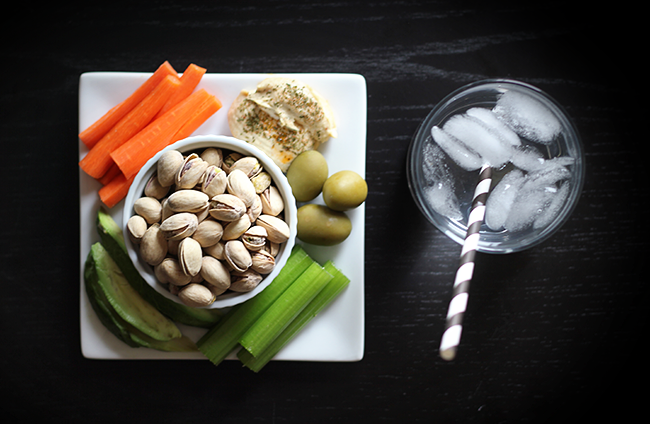 with snack plates that focus on a variety of goodies like you see here: carrots, avocado slices, celery, green olives, hummus, and the star of the show - pistachios. 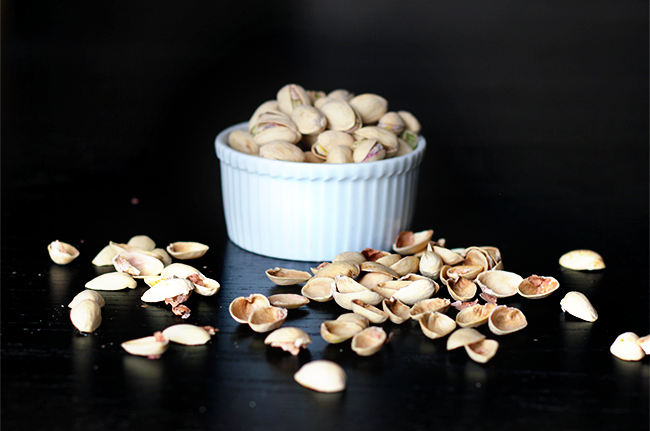 Pistachios are one of the lowest calorie snack nuts (for every one-ounce serving, pistachios offer about 49 nuts per serving; peanuts offer just 28, cashews 18, and walnuts 14 halves, and almonds 23 in the same 30g serving). 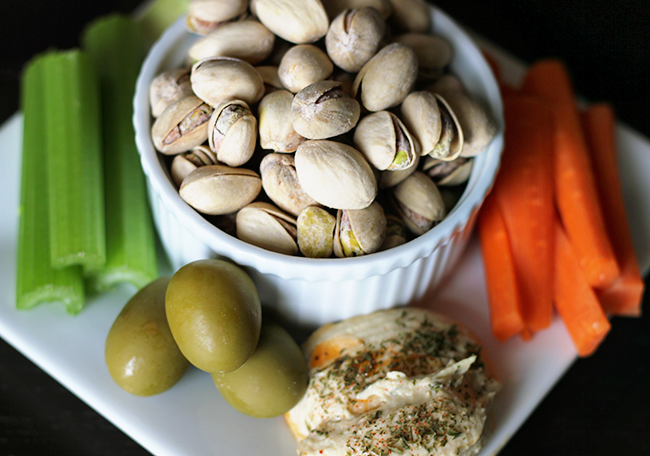 And unlike other snacks like potato chips, pistachios offer a good source of protein and fiber, without the excess fat and calories. 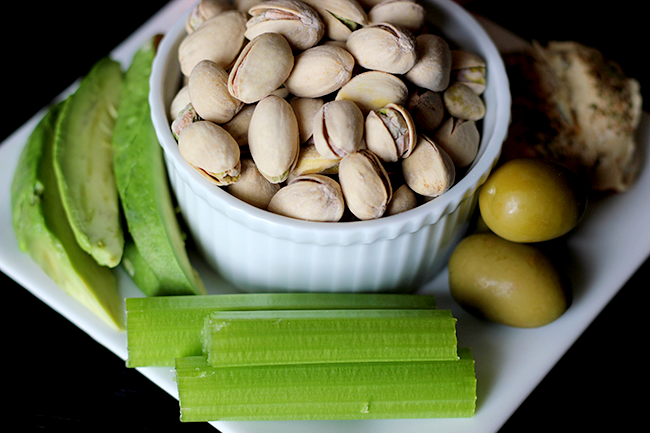 You can enjoy about 30 pistachio kernels for 100 calories. Yes, please. There is also something called the "Pistachio Principle" - a simple, mindful eating concept that may help you (wait for it) fool yourself full without feelings of deprivation. There have actually even been two preliminary behavioral studies by Dr. James Painter that suggest that individuals can reduce their overall calorie consumption without consciously restricting their diets. 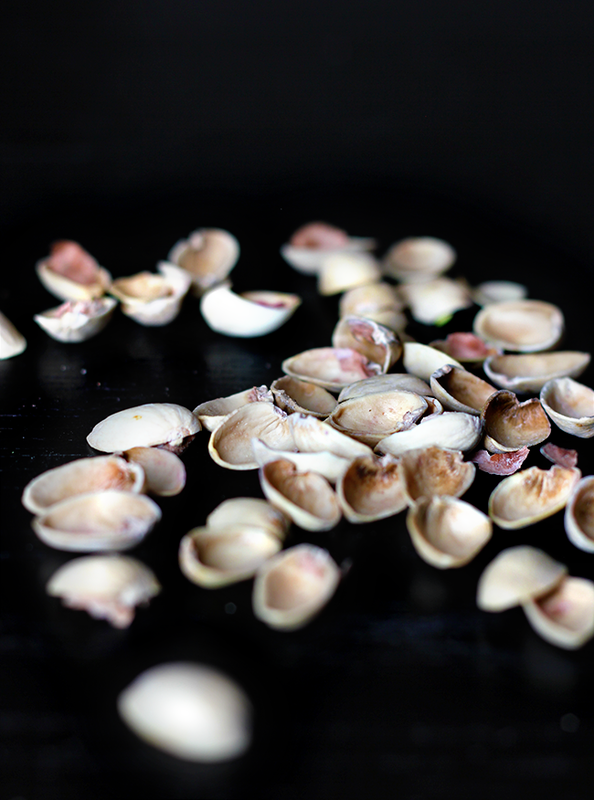 The premise is that consumption of in-shell pistachios encourages slower eating, while the leftover shells offer an important visual cue about the amount consumed. Pretty cool huh? And it makes sense! When I'm working on the computer, or watching a movie at night, I notice that I tend to snack without thinking. 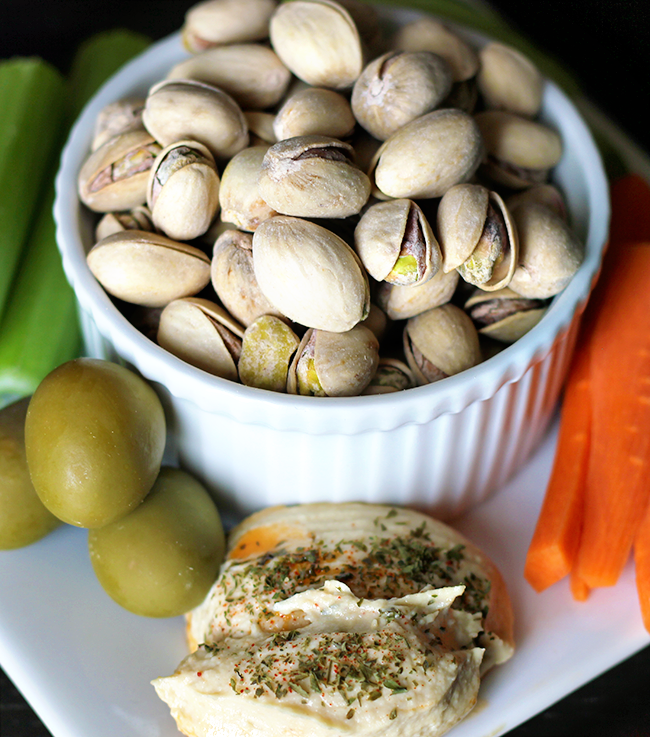 By creating these healthy snack plates, and focusing on pistachios as the main ingredient, I'm reminded of how much I've eaten just by looking at the empty pistachio shells. It really does encourage me to be mindful of how much I'm consuming, especially when my brain is focused on other tasks. Eat from smaller bowls, which may help you eat less and still feel satisfied. Additionally, drink from tall, slender glasses rather than short, wide glasses which may make you feel fuller on fewer calories. Purchase single-serving chips and small-size candy bars in place of family-size bags. A study suggests that the large package size increases caloric consumption by an average of 22 percent. According to Dr. Painter, bright lighting and fast music may encourage you to eat faster and consume more calories. One study suggests that when participants were instructed to eat at a fast or slow rate, consuming food at the slow rate helped participants achieve satiation quicker with less food. This suggests that slow eating may prevent excessive food consumption. 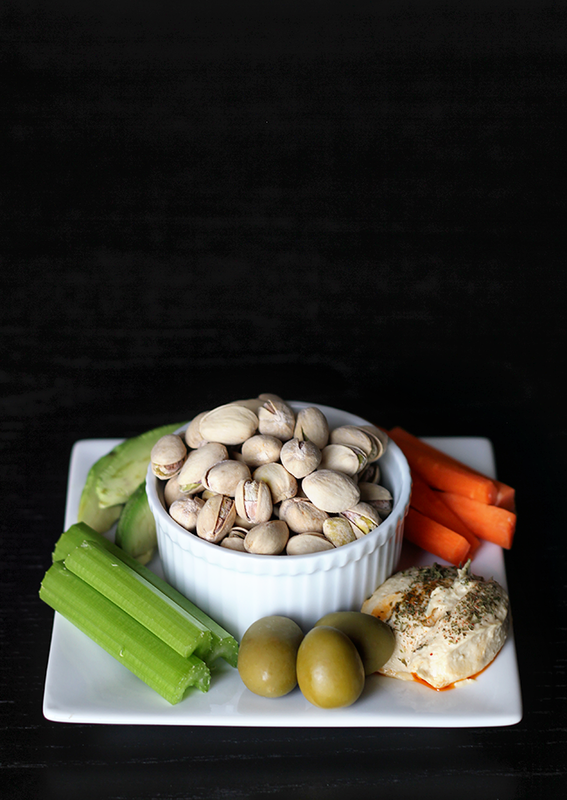 In addition to the snack plate ingredients you see in these photos, I've also made them by pairing in-shell pistachios with a few small slices of white cheddar cheese, edamame, apple slices, sprouted pumpkin seeds, fresh zucchini, and/or plain Greek yogurt. The possibilities are almost endless. 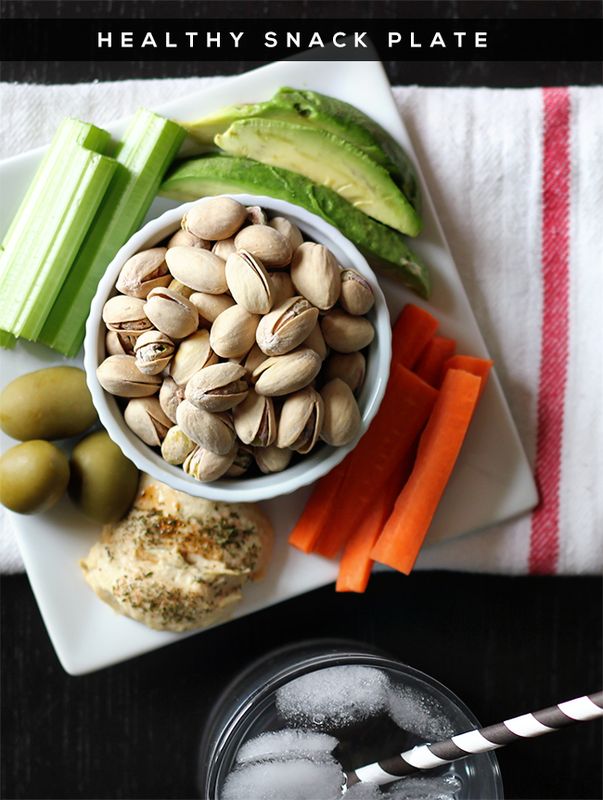 Just focus on a variety of healthy, whole foods that pack a punch without empty calories, and remember not to go overboard with portion sizes. 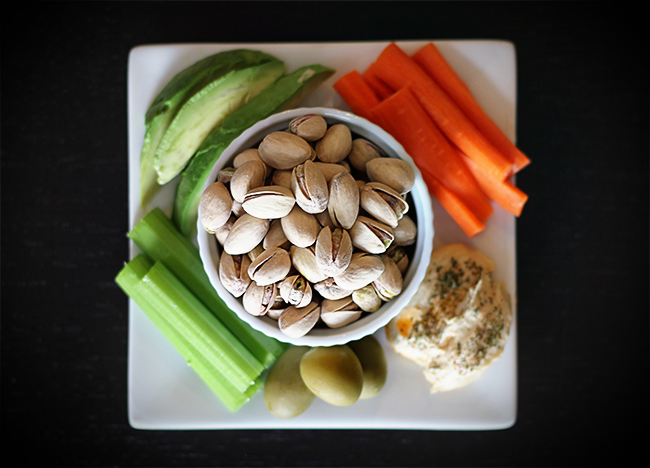 Who else is a fan of in-shell pistachios as a mindful snack? (If you are, make sure to enter the Pistachio Health Institute's Facebook sweepstakes for a chance to win a year's supply of pistachios!) 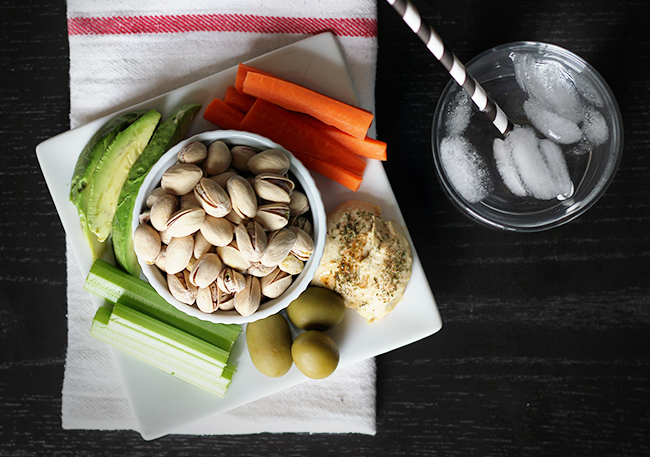 Any other healthy goodies you suggest that I could add to my daily snack plate? Thank you for supporting Bubby & Bean by allowing me to post occasional sponsored content. I was selected for this opportunity as a member of Clever Girls and the content and opinions expressed here are all my own. Great advice about buying smaller portions! Ever since I was a child pistachios were a favorite of mine and they still are. I just wish they weren't so expensive, a small bag costs almost $10 at my local grocery stores. This is a really great and timely post as so much of our population is struggling with weight issues brought about by the fast food industry and foods laden with sugar and unhealthy fats. It's nearly dinner time, and I would love a plate like that right now! I've been looking for a healthy snack that I can keep in my studio. I don't have a fridge, so it limits some fruit and veggie options. I love pistachios...thanks for sharing! I LOVE pistachios! Your snack plate looks so yummy.